In a fresh new direction for BALLY, the launch of the Spring / Summer collection for 2011 injected a dose of uplifting atmosphere into the steps of their Beijing VIP guests. A glamorous fashion party to celebrate the opening of the BALLY Singapore flagship at the ION Orchard, in the cities newest destination mall. 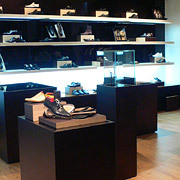 BALLY, the long-standing Swiss luxury goods house in business since 1851 is one of the most successful luxury brands in Asia. In particular it is the brand of choice within the men’s business wear category, renowned for its quality shoes, belts and accessories.